Ok, this is stunning. I think it literally took my breath away when I first saw it. It’s so bold yet so delicate — look at that intricate detailing in the setting! It’s just ridiculously gorgeous. What a statement piece. 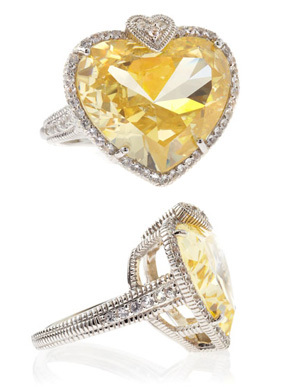 Made from sterling silver, and heart-shaped canary crystal center stone is 27.24 carats. White sapphire bezel. Crazy. Love it so much I want it in every color…except it’s just a tad too expensive for that. Just the right price for a nice splurge. Get it here from Neiman Marcus Last Call (on sale!!!) for $243.75. Ok, I’ll admit it, I’m suddenly slightly obsessed with Judith Ripka. Pretty gemstones. Great detailing. Rich texture everywhere. What’s not to love? These pieces just look so inherently rich. 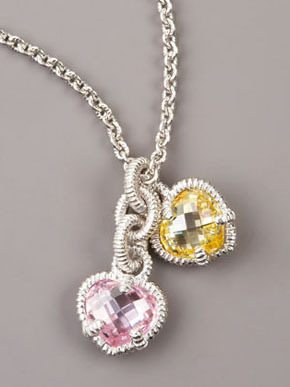 This particular charm necklace is on the whimsical side and it’s simply adorable. I want these on a necklace and on a bracelet! So feminine and yes, perfect for Valentine’s Day. They come in a ton of different color combinations so go find your favorite! Get it here from Neiman Marcus at $250. Seriously, how gorgeous? The detailing is simply beautiful; these have a simple, classic silhouette yet will really pop and draw all the attention to your ears. Most of all, this color is so saturated, so deep, so rich, so powerful, yet feminine. I love these so much and I don’t even have pierced ears! These make me want to find a way to convert the back to clip-ons. I need these. Get them here from Saks for $675 (ok, I know, the price is a huge stretch for most of us, but what a fantastic splurge…). 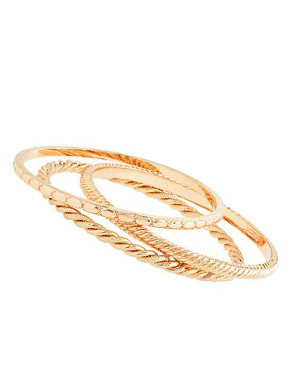 These are great, everyday basic bangles that are not so basic because of the great texturing. Pair with a watch, wear one or all simply with a black maxi in the summer, or even with a white button-down and a great pair of jeans. 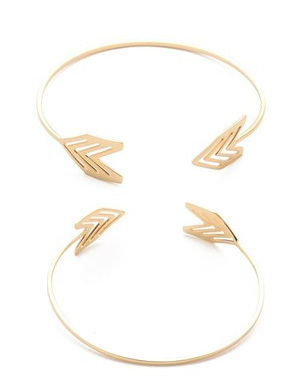 Gorgeous, affordably priced, this will be my Spring/Summer go-to bangles. Get them here from J.Crew for $39.50. There’s something really effortless chic about a rich leather paired with gold hardware. 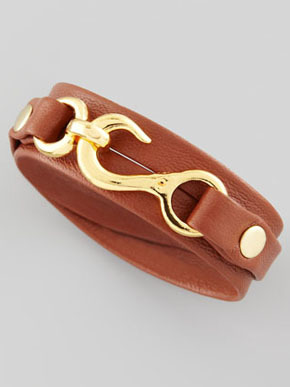 This seems like a growing trend — Hermes started it I think with their Jumbo Hook bracelet, which is literally a piece of leather with a gold hook. It’s a bit boho chic but very preppy, especially in this cognac color. I think this is another must-have for me. Get it here from Neiman Marcus for $80. Simple. Gorgeous. Effortless Chic. Perfect stacked with other bracelets or with a gold-tone watch. Chevron seems to be trendy right now, so this is spot on. And for a relatively affordable price. Get it here from Shopbop for $80. 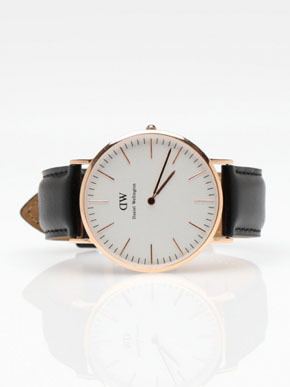 I’m obsessed with Daniel Wellington watches. They’re so classic and so preppy. 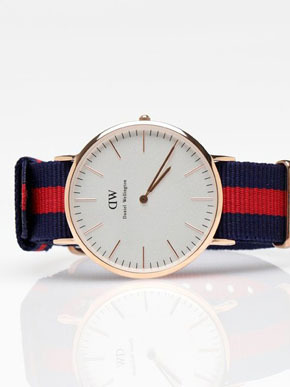 I love the rich leathers (currently they offer black, brown croc, and cognac) paired with the elegant, understated but luxurious rose gold, and I love that you can swap out the straps for uber-preppy NATO straps for a completely different look. The company is relatively new and based out of Sweden, so the prices you see everywhere for their watches actually include 20% (or is it 25%?) VAT, which will be deducted from your final price when you check out if you live in the US. I’m definitely picking up this watch — now the question is, which straps? All? I shall collect them one by one until I have them all! The NATO straps are only $35 each, so technically you’re getting a totally new and different-looking watch for just $35 extra each time! Get them here from Need Supply. Lady versions are cheaper than male versions, all either $175 (for NATO strapped ones) or $199 (for the leather strapped ones). 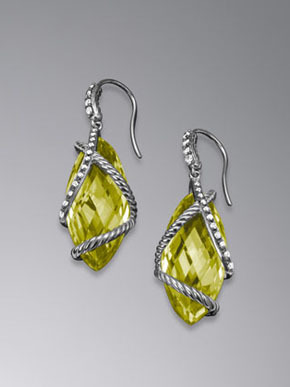 Ok, David Yurman is not normally in my vocabulary. Actually, he never has been. These earrings are way out of my normal price range, but one can always think, “one day”…right? 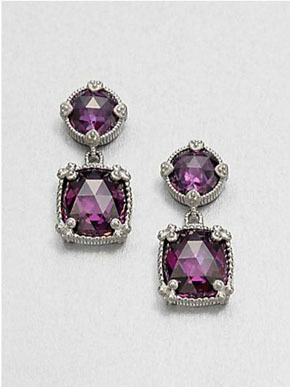 These earrings are stunning. What an unique combination of elegance and edge. It’s almost as if something beautiful and very aristocratic has been bound by barbed wire. It’s a conversation piece that will stand out yet is very understated at the same time. If I ever get my ears pierced, I will definitely be saving up for this one. Comes in a variety of colors too, so check them out. Get them here from Neiman Marcus for $1500 (I know).